"The description is a bit confusing. Samp is just an Algonquin word for hominy, ... read full review"
A corn product made from hominy that has been coarsely cracked. 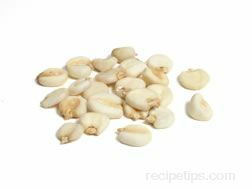 (Hominy is also coarsely ground. There are medium and finely ground versions, too.) Traditionally, the word samp, from the Algonquin, nasàump, referred simply to “hominy” and was not a name given to a specific type of hominy or as a reference to the size of the pieces after cracking or grinding, and so, over the years, the word samp, became a term that was interchangeable with the term hominy. Since American colonial times, the word has also been used as a name for cereal, cornmeal mush, or porridge made from hominy. Samp can be boiled or fried and served as a side dish. It can be combined with other ingredients, such as meat, or it can be formed into cakes or used as a filler in soups and stews. Samp is also known as “big hominy”; a reference to the size of the pieces after cracking.